This is a log of the chat room during the live audio chat from September 29, 2005 on DeXter and the Delphi Roadmap with Michael Swindell, Director of Product Management. davidi:erwien: "will ECO basic be explained here? What will be in it, etc." - Michael is explaining ECO now. There are also lots of articles and BDNtv episodes about ECO. John mentioned that more ECO information and tutorials will appear on BDN in the coming weeks. davidi:SteveA: "Will you have the full doco for ECO state machine and other new features at or before release date?" - John mentioned that more ECO examples and tutorials (BDNtv) will appear in the next two weeks. davidi:JoeH: "How round trip will Together in DeXter be for code implementation generation/refactoring ?" - Michael states that DeXter will have Together "live source" technology for all Delphi applications. Full round trip. Can develop in the model, can develop in code. davidi:RobJLove: "C# Support in Together?" - Michael states that DeXter Together technology will support Delphi Win32, Delphi .NET and C# languages in this version. C++ support for Together will be added in the future. DeXter Together also supports code audits and metrics, document generation, pattern support, and refactoring. davidi:JoeH: "Will DeXter be faster than D2005 ? (without diabling features like Together)" - Michael is talking about the performance and quality efforts that the team is putting in to DeXter. The team is looking at architectural issues, memory usage, etc. DeXter has a new memory manager that is improving the performance, stability, and memory footprint. There are specific team members dedicated to quality/performance issues. davidi:outchy: "any plan to optimize the IDE for low computers ?" - Michael is talking about tuning DeXter. davidi:jozzb: "what VCL improvements (besides porting) are in the pipeline?" - Michael is talking about VCL compatibility and support for Win32, .NET 1.1, .NET 2.0, .NET Compact Framework, and into Windows Vista. aohlsson:outchy: "will ECO be shipped with personnal and professionnal versions of Dexter ?" - Michael stated that ECO will be in multiple SKUs, not which ones. aohlsson:LauchlanM: "is the new together stuff for all SKUs?" - We’re not providing exact SKU information at this time. jkaster:davidi: "will C++ CLR (managed C++) be placed on the roadmap some day?" - michael: We’d like to get that on the roadmap, and we’re researching that internally. jkaster:davidi: "Will there ever be a Unicode version of VCL Win32?" - Michael: Our goal is that all of the runtime and design-time pieces of Delphi need to be unicode. It’s going to be a multi-release, multi-year effort for complete Unicode support. jkaster:chewy: "Will there be wizards/experts for Windows Services development in C# or Delphi.NET?" - Michael: I’m not sure, we’ll have to look at that. jkaster:chuckm: "will Together have an API for writing experts to generate custom code, not just class declaration but actually implementation as well" - Michael: We don’t have that as a feature in this release, but we’ll add it to the list. jkaster:pachecoes: "ECO for VCL.NET?" - Michael: For DeXter, we don’t have this feature, but we have it for Highlander. jkaster:Serge_D: "how exactly 64bit compile is addressed in DeXter?" - please rephrase. I don’t understand. jkaster:Serge_D: "what are plans for VCL being .Net compatible? regular .Net classes to see and understand core VCL classes - Control, Collection, etc" - Michael: Right now, we’re not going to be doing a lot more interoperability than what is already there. jkaster:outchy: "/ask in the last versions, Delphi started integrating opensource codes, any roadmap about that ?" - Michael: It’s not part of our strategy to look for OS projects to put in the product. It’s when we’re looking for the best solution. jkaster:JoeH: "will ASP.Net2 ‘beta’ compatibility be available before Highlander release ?" - Michael: We do intend to be more open about technology previews, especially with our 2.0 support. I would plan on seeing something before Highlander. jkaster:JoeH: "will ECO2 3rd party mappers work in ECO3 ? (I use NexusDB with ECO)" - Michael: the plan is for the third party providers and mappers to be available when we release. Ask your third party provider about this. jkaster:x64-lover: "Any chance of a profiler (even a basic one) being included with Delphi in the future?" - Michael: There’s always a possibility. That’s definitely one we always look at each release. davidi:__WILL__: "Will we see the return of CLX?" - This has already been answered by Michael. We will continue to work with the Kylix Community Project - freeclx.sourceforge.net. jkaster:Serge_D: "any plans to make ECO available for MS VS200x?" - Michael: That’s an interesting question. It’s something we definitely could do, and we’re looking into. It’s not on our roadmap currently. davidi:chuckm: "will Borland relent and finally announce whether they’re going to support 64-bit native app,...oh wait nevermind. <g>" - Michael said that 64-bit native compilers are on the roadmap in the 2007/2008 timeframe. davidi:outchy: "According to the roadmap, Won’t Delphi be a module of VS ?" 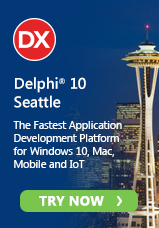 - On the roadmap, there is no mention of Delphi as a module for Visual Studio. aohlsson:JoeH: "what are the SKU diff’s in SKU’s for DeXter and Highlander ?" - We’re not quite ready to discuss what’s in what SKUs at this time. jkaster:RobertD: "StarTeam Std is included with Delphi--any chance of a CaliberRM server?" - Michael: There’s a chance for that. We currently don’t have plans but would like to get that worked out. jkaster:__WILL__: "Will we be seeing Delphi for the Mac(considering the Intel/Apple issue)?" - Michael: Boy, I’d love to do something like that. Right now we’re focused on the Windows platforms. jkaster:hazard: "Any chance to include an localization tool with easy language edititing outside an IDE (like text files)?" - Michael: We do have ITM, which can be provided to a localization service. We really haven’t productized them so that everybody knows about them. jkaster:erwien: "will Highlander supports .Net 1.1 or only .Net 2.0?" - Michael: Probably only .NET 2.0. DeXter will support 1.1.
jkaster:chewy: "How about Delphi for Java?" - Michael: That again! Wow! That would be interesting. jkaster:venks: "Will there be a reporting tool supporting both win32 &amp; .net in Dexter?" - Michael: Rave reports will support both. jkaster:cleggy: "is there going to be an update to the Easter Egg game in the About Box. I’ve mastered that level already :-)" - Michael: That you’ll have to wait and see. Buy DeXter and pull up the Easter Egg to find out! holger: k. did I make it back from Frankfurt in time? holger: or did I miss it? holger: but I cannot sleep as the drive back from Frankfurt was pretty nerve wrecking. outchy: when will the audio stream be available ? Serge_D: Hello! What music is on? RobJLove: Yes, not using it I trying to put up the maint message telling people that now. RobJLove: ok maint message is up. TPersiste: Everybody in the chat gets a free copy of Delphi 2006, right? jozzb: where’s the "i’m listening" button? I got an urge to click! TPersiste: 17 of those people are just me logged in under different names. I am winning this free Architect, this time, I am telling you! Serge_D: Big applause for David I and team for EKON announcments!!!! x64-lover: mms://bdntv.borland.com/chat fails to connect in WMP10, is it live yet? DaveN: are you in France outchy? RobJLove: way too much fun. bmcgee: Will that be in the playback? Serge_D: !!!!!!!!!!!!!!!!!!!!!!!!!!!!!!!!!!!!!!!!!! are you as wet now as Balmer? outchy: any equivalent of Balmer at Borland’s ? __WILL__: Or do I represent them all again? chewy: Is anyone else here? chewy: Got sound and radio or not? MalcolmG: chewy, got up early did we? DaveN: who picked this music? chewy: I’m not due for work in 2 hours. chewy: But I’m in the office already! JoeH: chewy, you workaholic ! cleggy: Do you have a spare arm I can borrow there chewy? chewy: I’m just here to listen and participate... I’m not working... haha. chewy: Besides, they might be drinking coffee or wearing pajamas! chewy: Tim actually haven’t watched Child’s Play before! chewy: Child’s Play for ECO, starring Alex Jarvis. chewy: what’s with the buzz??? outchy: stop cell phones please !!! Serge_D: did you put his phone on microwave? DaveN: was? is it no longer cool? imw: ask: what’s the biggest challenge for delphi when implementing .Net 2.0 features? chuckm: is there an official roadmap posted yet on the web? TPersiste: That pickle, you are talking about, sweetens the deal. I’ll take it! JoeH: x64-lover.. where ? which QC’s ? erwien: hey... bug 9775 is fixed, interface delegation using implements! MalcolmG: just like all the voices in your head, right? chewy: David, I didn’t say it doesn’t make sense. chewy: Malcolm, need a beer? JoeH: native 64bit - yay ! Robin_AU: too early for beer? Robin_AU: never too early. Ever. TPersiste: I am drinking Alaskan Amber alt style beer here. It’s bland, but it’s good, because it does not distract from presentation. MalcolmG: a Kiwi thinking about more than one thing at a time? chewy: What’s his full name? NickH: Hello -- I’m not listening but only chatting. NickH: I’m caught in a user group meeting. JoeH: DUG’s are deadly ! erwien: did he said sequence diagram or no? chewy: cleggy, say you’re talking to Danny Thorpe or something. jthurman: cleggy: Turn off the phone and close the door. EricSasse: Are we going to have Designer Guidelines for VCL Win32? EricSasse: DaveN, I didn’t see it.. are you going to have it? chewy: So now I need to buy a UML book? chewy: Revive the project of 1998! JoeH: ..keep it simple ! chewy: Delphi for Java, Delphi for .NET, Delphi for Win32. JoeH: cool. lookfoprward to meeting you guys ! outchy: chewy: why a wizard for creating services ? chewy: Can’t tell who’s Danny from all the voices talking together. cleggy: Cool! ECO VCL.NET for Highlander! chewy: getting hot there, cleggy? cleggy: Yep. This leg shaking is hard work! chewy: Like what? Sidewinder? Cobra? Rattlesnake? chuckm: will Integer stay 32bit in 64bit delphi? erwien: And Dexter? He works at Borland? chewy: Nick, what time is it in US? unixguru: is live audio not working? chewy: Now I know how John ask questions!!! chewy: new meeting notes! woohoo!!! Serge_D: Please team up with Automated QA? !!!!!!!!! venks: Does any knows what is the latest on SA .Is it 20 % or 30 % ? JoeH: cleggy - yeah ! chewy: DeXter is not a toy! fdweller: Has anyone any news on a Kylix personality for BDN? fdweller: er, BDS, that is. JoeH: 64bit native apps will insure longlive for Dlephi ! chewy: darn, I just yawned and lost some of what the guys are saying! fdweller: Heh, tried that - as usual I received vast, echoing SILENCE. kgberry: Is code coverage on the roadmap? i.e. to verify unit tests are complete. JoeH: kgberry: ‘verify unit tests are complete’ ? kgberry: You can use code coverage to see that your unit tests are covering any new code introduced etc. erwien: how long is this chat? Serge_D: To John: How many people are actually listen audio feed? __WILL__: Where is the roadmap published online? TPersiste: 9000 hrs according to the event central. unixguru: how come the realtime transcription feature doesn’t work here? Robin_AU: Is Dexter likely to be released as a ‘personal’ version like 2005 was? RobJLove: According to the .NET spec I think that a there is a bit flag in the header marking (Open, 32bit, and 64bit support) So I suspect that D2005 might even work on .NET for 64 bit if the flag was set correctly. JoeH: RLove, when will the new BDN url stuff be launched ? DaveN: using what? Shorl? TinyUrl? RobJLove: Lets talk tommorow Chewy. NickH:Delphi on Eclipse? I’d rather rub my paper cuts in lemon juice. JoeH: don’t stop ! keep going for 24 hrs ! outchy: I vote for a code formatter ! outchy: anyone reports a QC ? JoeH: vb.net ? isn’t that a virus ?? jthurman: I’ve thought about a code formatter too. chewy: How about Delphi for Java? JoeH: Delphi For Atari ! NickH:Delphi for the Mac? I’d rather run sandpaper over my eyeballs. outchy:Delphi for XBox, PS3, GameCube !!! JoeH: games ?! don’t you write all biz apps on Amiga ? __WILL__: The contest was a nice success! chewy: I thought there’s a leet command? NickH: Delphi for Java? I’d rather peel all my skin off with a butter knife. x64-lover: And what about Mono 2.0: Stereo? unixguru: what about Delphi 2005 Update 4 official???? chewy:Delphi for Eclipse? Eclipse is not a platform! jozzb: great show, thanks yall! chewy: Thanks for listeting to this Borland chat, everyone! hazard: cleggy: what easter egg game? JoeH: thanks for a great show guys ! Delphi FOREVER !! Serge_D: Very good, thank you!!!!!!!!!!!!!! unixguru: I guess it’s over then??? kgberry: chewy: You can build Eclipse framework apps- i.e. they run on top of the framework. bmcgee: Thanks guys. Great job. chewy: how shortly is shortly? chewy: hmm, back to work! hazard: i will see Delphi in my dreams!